Protein citrullination (a.k.a. deimination) is a novel arginine-directed post-translational modification (PTM) that results in a permanent change in the targeted protein. 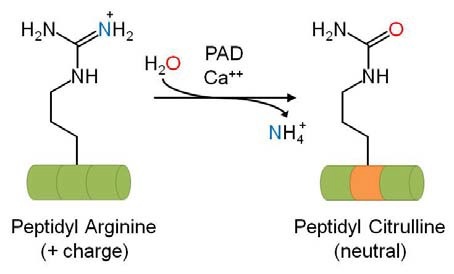 PeptidylArginine Deiminases (PADs) mediate the calcium-dependent deimination of the guanidino group of Arginine side chains to form an ureido group and the non-standard amino acid citrulline. Some biologically relevant proteins known to be citrullinated include Keratin, Filaggrin, Trichohyalin, Vimentin, Myelin Basic Protein (MBP), Histones, alpha-Enolase, Fibrinogen, Fibrins, Collagen type I and II, beta-Actin, and Tubulin 9-11… It is noteworthy that several of these proteins are part of the cytoskeleton and/or are structural in nature. Citrullination of peptidyl-arginine by peptidylarginine deiminases (PADs). In their October newsletter, Cytoskeleton Inc. presents an overview about the consequences of citrullination, especially referring to cytoskeleton proteins such as Vimentin. Interested in this exciting new PTM mechanism?